Exploring real life stories helps us to better understand the value of those lived experiences, leading to improved health and resiliency. Sharing those stories is also vitally important, not only for our own well-being, but to strengthen our relationships with others and weave threads of compassion between us. And there’s no better time than August for gathering seeds of inspiration! Join me for StoryCraft: The Art of Writing about Life, a full day writing event in Riverview, NB. We’ll cover the writing process from information gathering and drafting, through plotting and structuring a story. 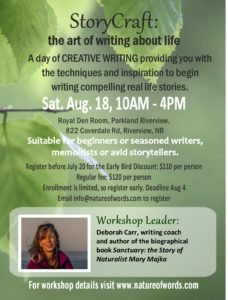 Whether you’re writing memoir, essays or simply for pleasure, you’ll learn creative techniques to generate ideas and craft compelling stories. This is all you need to get started! >>Registration info and workshop details here.